ExpressVPN is one of the world’s most popular VPN services, enabling you to connect to the internet through a Virtual Private Network link. It's a good offering with an intuitive interface, though our main reservations are around its disappointing impact on your internet speeds and higher than average price point. Its VPN software runs on most devices and operating systems, though only three of your devices can be connected at any one time. Like any VPN service, ExpressVPN can help protect your privacy and anonymity while you’re online. It encrypts and protects the data flowing through it while disguising your true location. For example, you can appear to be browsing the web from New York, when you’re actually based in San Francisco. In doing so, a VPN can help safeguard your online privacy. This can give you a more secure connection when, for instance, you’re connected to a public WiFi network in a coffee shop or hotel lobby, or you can use it to help ensure that nobody is snooping on you while you’re browsing at home. Even the websites you connect to won’t be able to work out your real IP address or true location. A VPN can also help you use websites and online services that might be blocked in your country or one that you’re visiting. You can use them to watch US TV streaming services while you’re travelling abroad, or to watch, say, British shows on the BBC’s iPlayer app even though you’re not based in the UK. 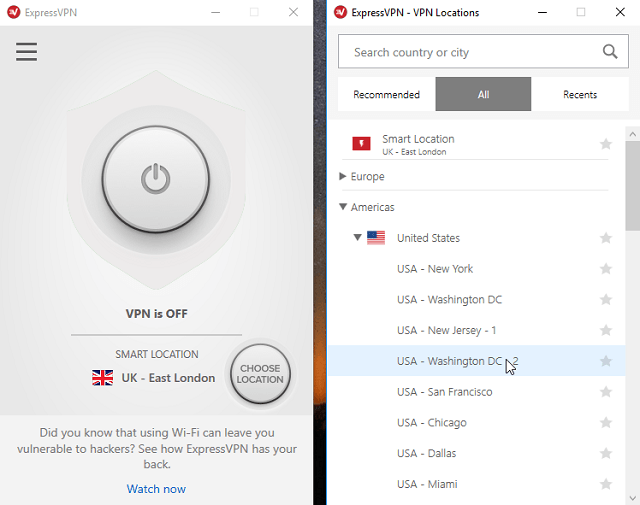 ExpressVPN has a strong set of features, and it’s a slick VPN to use. ExpressVPN is pretty smart when choosing a server for you, picking the fastest it can find in your selected country or location. In most cases, you just click the Connect button and let it do its thing. 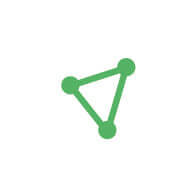 Finally, it’s one of the few VPN services that actively supports running Peer to Peer traffic, even including a tutorial on using the uTorrent client over VPN. You’re not stuck with ExpressVPN’s default server selections, of course. If you want to choose your own, then finding a server won’t be a challenge. Server options are divided into Recommended locations and locations further afield, in Europe, the Americas, Africa, the Middle East and Asia or the Asia Pacific. The service’s general ease-of-use carries over to the mobile app, which is near-identical in look and feel to the desktop client. It’s a straightforward tool to use, no matter which device you’re connecting over. The Split Tunneling feature allows you to select certain apps to use the VPN and others to use your regular internet connection. That’s useful for any apps where you’re not worried about your privacy or security, but you need to have the fastest possible connection. What’s more, some streaming services won’t work if they detect that you’re using a VPN, so you can set these to use a regular connection. ExpressVPN is certainly one of our preferred VPN services, but our tests still picked up some room for improvement. Plenty of VPNs claim to get you around Netflix’s blocks, but ExpressVPN proved unlucky in our tests, The US Netflix service spotted we were using a VPN to access it from abroad, and hit us with an error message when we connected from abroad. Internet speeds can be hit-and miss with the VPN enabled. Our tests detected a typical speed loss of around two-thirds, whether you’re connecting via a local or international VPN server. There was some significant variation in this performance, too. We found you can be connecting at 12Mps one minute then reconnect to the same server 10 minutes later, only to find your speeds slammed down to almost half of that. Inevitably, there’s some loss of speed when connecting via a VPN. 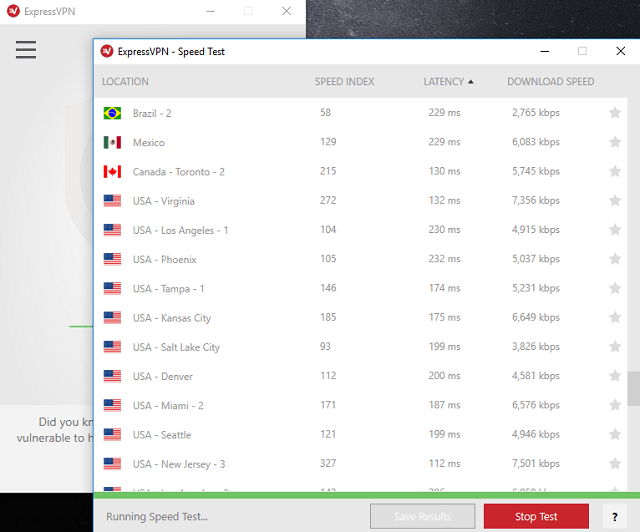 Both over long and short-distance connections ExpressVPN isn’t as speedy as some other brands we’ve tested, including VyprVPN and NordVPN. ExpressVPN is a relatively expensive VPN, with a monthly fee of $12.95, though this drops to $8.32 if you pay for a year upfront at $99. To put this in perspective, you would pay less to use NordVPN or PureVPN for two years, so ExpressVPN isn’t great value for money. Need to try out ExpressVPN now? Follow this link for deals. It’s easy to sign up to ExpressVPN – you submit your email address, select a price plan and choose your payment method, then ExpressVPN emails you a password and an activation code for the desktop app, along with a download link. You need to copy and paste the code in when you first launch the app, though you’ll still need your password to sign into the Mobile app. Once you’re up and running, ExpressVPN is easy to use, backed up by simple but intelligent instructions and effective online help and walkthroughs, complete with screenshots and clear steps to follow. There are even instructional videos to cover the most common uses. There’s a big button to quickly connect and disconnect to the VPN, plus you can change server locations at using clearly marked options. ExpressVPN is a solid and straightforward VPN that’s easy to get to grips with. Unfortunately, it’s not particularly cheap when paid monthly – nor is it the fastest VPN when in use. When other services are both speedier and more affordable, ExpressVPN has more work to do to stand out.